Members of the Calgary Police Service Honour Guard brought in 300 shoeboxes full of gifts which will be sent around the world by Samaritan's Purse's Operation Christmas Child program to children in need for the holidays. There was an interesting work break at the Samaritan’s Purse Canada office in northeast Calgary Tuesday, as around 125 volunteers stopped what they were doing for a special presentation. 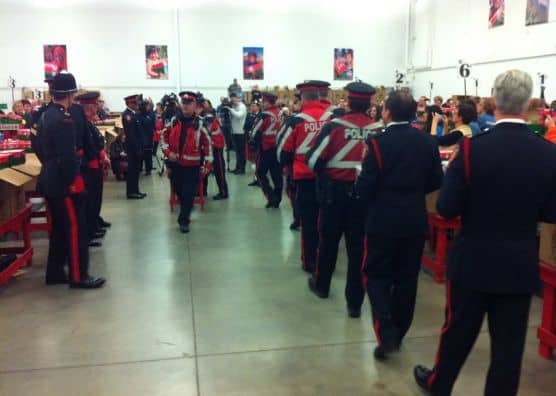 Members of the Calgary Police Service Honour Guard brought in 300 shoeboxes full of gifts which will be sent around the world to children in need for the holidays. 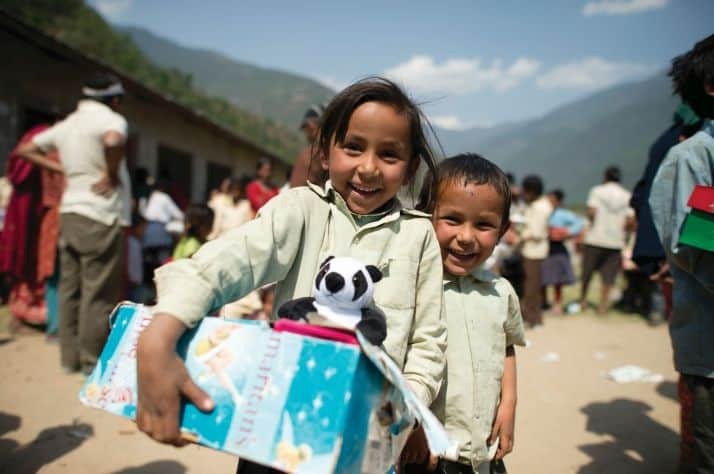 Back in June, members of both organizations went on a trip to Costa Rica to hand-deliver boxes and they will be doing that again in March. Cst. Garry Woods was one of the officers on that trip, as well as in the processing plant, and said the experience of handing a gift to a child in need is unforgettable. In the plant Tuesday, the officers marched in as the volunteers paused from their work for the presentation and after a moment of silence for officers who were lost this past year, they were applauded as they left the floor. “To walk in here with that and have that kind of reception, that’s just the icing on the cake for us,” Woods said. Every box that comes into the centre is inspected by volunteers to make sure there’s nothing dangerous, harmful or something that could spill in the box. Frank King with Samaritan’s Purse said the goal is to meet or exceed the total generated from last year, which was over 664,000. He added this year the boxes will be going to 14 countries, including two for the first time. “Ukraine and it also includes the refugees in northern Iraq who have been run from their lives from the ISIS terrorists,” he said, adding Tuesday’s event was also special for the volunteers. “It’s really neat to see the whole place go quiet and still and just have these Calgary police servicemen in their finest uniforms come up and make it clear that these boxes are important,” he said. Shoe boxes will be accepted in Calgary until Saturday and you can always pack one on their website.